Now that more and more jobs are requiring a bachelor’s degree as a minimum qualification, job hunters without a degree are running into trouble with their resumes. Even for jobs that do not hold this degree as a minimum requirement, employers tend to look for it in resumes as an indication that the candidate can follow through on a long-term commitment that requires sustained, hard work, and personal growth on many levels. However, fewer and fewer Americans are completing their degrees on time, if at all. From the cost of college to university campuses not being suited for non-traditional students, to changed majors, changed minds, and changes in health and life circumstance, job hunters have a pile of course credits with no overarching degree to show for it. So what can be done when it comes to your resume? You don’t have to shy away from higher-paying jobs that require the skills you have learned through academics and through work experience just because you don’t have a completed degree. The key ingredient is an effective resume that highlights your skills and unique qualities you will bring to the job. Here’s how. First, utilize the structure of your resume to set it up so your employer must read your strong suits, experience, and expertise before they get to your education. You can do this simply by placing your education section at the bottom, beneath your accomplishments and employment history. Make sure your employment history paints a picture of what you have done and what you have learned. Show how the workplace has also been an educational experience for you. Be as detailed as possible while also being concise. Use active words to describe your duties, and include any trainings or certifications received through your employment. Second, include a list of professional accomplishments beneath your objective. Include outstanding work performance and your unique skills and qualities you have proven that you bring to the table. Finally, when it comes to your education section, if the coursework you have completed pertains to the job you seek, list it individually. 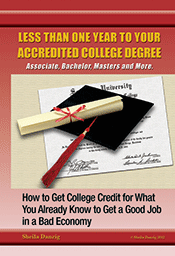 This implies that rather than having an incomplete degree, you have completed ADDITIONAL training and education. If you are currently enrolled in college, include educational in progress and list an estimated graduation date. If you have been enrolled in the past and plan on completing this degree, indicate your coursework completed as “credits earned towards…” and then list the degree. This shows that you are working towards something, and your goal is still in sight. Of course, there may be no need to write your resume without a college degree. If you have coursework completed and years of work experience, you likely already have the equivalent of an Associates or Bachelor’s degree. How can you get the academic credit for the work you’ve already accomplished? Visit us at thecareerpeople.com to learn how.